The ProLine® XE Combi Boiler comes with an industry-leading 4.8 gal/min capacity which is enough flow for a standard [or typical] 2 ½ bath home. The efficiency of the combi is rated at 95% AFUE (Annual Fuel Utilization Efficiency) making it available on many utility rebate programs. Lastly, the plain text Setup Wizard on the Smart Control LCD display will make installation a breeze. 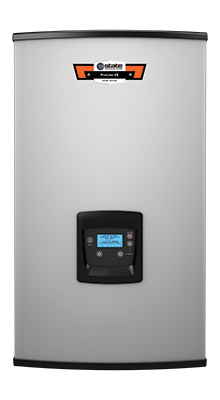 The SCB-199S-N indoor residential Ultra-Low NOx Combi Boiler uses up to 199,999 BTU/hr of Natural Gas to deliver a continuous supply of hot water and space heating for a home. This High Efficiency heating system has a 95% AFUE and is ENERGY STAR Certified.